With more than 1,000 kilometres of coastline there is no shortage of stunning locations to drop anchor while enjoying a private cruise or luxury yacht charter in Corsica. Here we select three of the best that truly show off the island's coastal character. 1. Girolata Bay The fact that there is no road to the bay of Girolata, on the southern edge of the Scandola National Park on Corsica's west coast, means that it has the seclusion that cruising yachtsmen usually seek. It also has remarkable beauty, with its striking red rocks climbing steeply from the bluest water to a gloriously jagged skyline 300 metres above. This, for Captain Giles Frankal, is one of the Mediterranean's most picturesque areas and his advice is to find a spot where you can drop the anchor close to the cliff and take a stern line ashore. Certainly, such an anchorage is only tenable when the weather is calm and settled but in those conditions an early morning swim beneath the rose-tinted cliffs, accompanied only by sea eagles gliding overhead, is one of life's great moments. By 11am in high summer the calm will be disturbed by tourist boats from the nearby village of Porto, heading for the little village of Girolata at the north-eastern corner of the bay, where an ancient Genoese fort overlooks a sandy beach and a few restaurants. Swimming, diving and exploring the many sea caves should fill the morning while the afternoon is perhaps a good time to explore some of the local well-marked and highly scenic walking trails that meander through the scented maquis scrubland. The best time to visit the village is following the mass evacuation that takes place with the evening departure of the tourist ferries. You can stay on to sample some of the best rustic restaurants in the Mediterranean serving ultra-fresh seafood, including the local Scandola lobster that is considered king of the catch. Girolata will surely be one of the most memorable stop-overs on any Corsican cruise. With more than 1,000 kilometres of coastline there is no shortage of stunning locations to drop anchor while enjoying a private cruise or luxury yacht charter in Corsica. Here we select three of the best that truly show off the island's coastal character. The fact that there is no road to the bay of Girolata, on the southern edge of the Scandola National Park on Corsica's west coast, means that it has the seclusion that cruising yachtsmen usually seek. It also has remarkable beauty, with its striking red rocks climbing steeply from the bluest water to a gloriously jagged skyline 300 metres above. This, for Captain Giles Frankal, is one of the Mediterranean's most picturesque areas and his advice is to find a spot where you can drop the anchor close to the cliff and take a stern line ashore. Certainly, such an anchorage is only tenable when the weather is calm and settled but in those conditions an early morning swim beneath the rose-tinted cliffs, accompanied only by sea eagles gliding overhead, is one of life's great moments. By 11am in high summer the calm will be disturbed by tourist boats from the nearby village of Porto, heading for the little village of Girolata at the north-eastern corner of the bay, where an ancient Genoese fort overlooks a sandy beach and a few restaurants. Swimming, diving and exploring the many sea caves should fill the morning while the afternoon is perhaps a good time to explore some of the local well-marked and highly scenic walking trails that meander through the scented maquis scrubland. The best time to visit the village is following the mass evacuation that takes place with the evening departure of the tourist ferries. You can stay on to sample some of the best rustic restaurants in the Mediterranean serving ultra-fresh seafood, including the local Scandola lobster that is considered king of the catch. 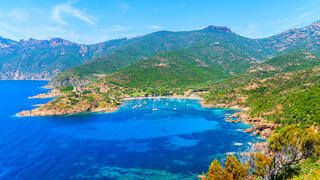 Girolata will surely be one of the most memorable stop-overs on any Corsican cruise. According to the owner of Farewell, this is a very sheltered anchorage from the wind and sea, and a quick glance at a chart shows why — lying on the south-eastern tip of Corsica, the fairly narrow bay is deeply indented. Just across the windy straits from Sardinia's Maddalena Islands off Porto Cervo, this undeveloped gem is a world away from the glamorous luxury of the Costa Smeralda. The blue-green tongue of water that probes inland is surrounded by white beaches and a mere scattering of houses, a few restaurants and a golf club. If you're in search of a little more excitement, just five kilometres across the island by road is the old port of Bonifacio, with its spectacular harbour bustling with life. 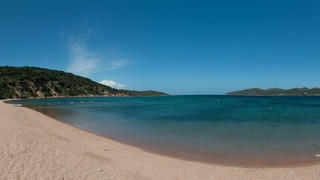 But, with unspoilt coves to explore by tender and calm, clear seas, it's easy to see the allure of Santa Manza. According to the owner of Farewell, this is a very sheltered anchorage from the wind and sea, and a quick glance at a chart shows why — lying on the south-eastern tip of Corsica, the fairly narrow bay is deeply indented. Just across the windy straits from Sardinia's Maddalena Islands off Porto Cervo, this undeveloped gem is a world away from the glamorous luxury of the Costa Smeralda. The blue-green tongue of water that probes inland is surrounded by white beaches and a mere scattering of houses, a few restaurants and a golf club. If you're in search of a little more excitement, just five kilometres across the island by road is the old port of Bonifacio, with its spectacular harbour bustling with life. 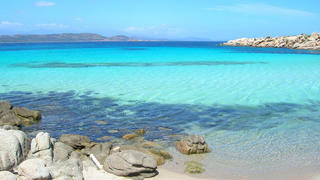 But, with unspoilt coves to explore by tender and calm, clear seas, it's easy to see the allure of Santa Manza. Nicknamed the Cursed Siren by navigators of old for the treacherous obstacles hidden in the deep waters around it, Cavallo Island has always been an island that keeps to itself. The Romans sent prisoners there to cut granite for their monuments, confident that they could not easily escape, but during Augustus reign it was abandoned and remained uninhabited for centuries until a shepherd called Terrazzoni moved there with his goats and sheep in 1800. Today it is a private island that has made a virtue out of its seclusion, creating a closed little one-square-kilometre world of its own. It is home to boutique hotel Hotel des Pêcheurs which has one of the best spas in the Mediterranean. Swimming, tennis and scuba diving are some of the activities offered but they can't compete with the island's natural attractions of white sand beaches, rocky coves, crystal clear seas, fragrant maquis scrub and above all, splendid isolation from the real world. Nicknamed the Cursed Siren by navigators of old for the treacherous obstacles hidden in the deep waters around it, Cavallo Island has always been an island that keeps to itself. The Romans sent prisoners there to cut granite for their monuments, confident that they could not easily escape, but during Augustus reign it was abandoned and remained uninhabited for centuries until a shepherd called Terrazzoni moved there with his goats and sheep in 1800. Today it is a private island that has made a virtue out of its seclusion, creating a closed little one-square-kilometre world of its own. It is home to boutique hotel Hotel des Pêcheurs which has one of the best spas in the Mediterranean. Swimming, tennis and scuba diving are some of the activities offered but they can't compete with the island's natural attractions of white sand beaches, rocky coves, crystal clear seas, fragrant maquis scrub and above all, splendid isolation from the real world.